I think most professionals who design product interfaces (both physical or software interfaces) will agree that simplicity and discoverability of an interface is a big winning factor. Simple and discoverable interfaces are usually self explanatory and for this very reason they tend to provide great user experiences. On the other hand, this doesn't mean we should stop providing documentation or user manuals for our products. A discoverable user interface with a clean, easily accessible documentation is I think what every product deserves. When it comes to user manuals or guides, I'm so much in favor of a user manual that's deeply connected or embedded to the user interface rather than a pile of content parked somewhere completely disconnected from the actual product. UI embedded manuals can be designed in many ways, one of which is through a concept called "App Walkthrough". From a conceptual point of view I knew what an app walkthrough is for a very long time but before I sat down to write this post I was tempted to call it "in-app tutorials". After some searching around the topic, I discovered that it actually has a common name. Implementing a successful app walkthrough is not an easy endeavour at all. It's like a double edged sword. If you get it right it's all unicorns and butterflies. If you get it wrong you can do more harm than good. A quick opt out button on each individual step of the walkthough so that users have an easy way to exit the tutorial without being forced to complete it. 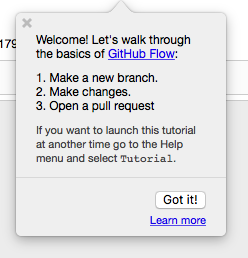 Update: Right after I wrote this blog post, I came across a tutorial that's built into GitHub Desktop (for Mac). See the screenshot below. Clicking "Got it!" takes the user to the next step of the tutorial while clicking the close button on the top left corner stops the tutorial. It's brilliant. An overlay that makes the UI frozen while the tooltips are running. If a user doesn't follow the tooltip popovers and starts clicking around, things get messy (and this is bound to happen if I know anything about users). Inside the Aurelia app, I've created a component called "TooltipService" which is responsible for orchestrating the walkthrough. There's also a separate data holder class "Tooltips" that declaratively defines all walkthrough steps and their contents, positions etc. Tooltips are created using the popover component from Bootstrap 4 (still in alpha at the time of this writing).